Seriously though, everyone loves a good crunchy, perfectly salted tortilla chip. 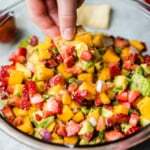 They easily complete sandwiches, make turkey chili 10x better than it already is and just so happen to be the perfect companion to guacamole. I”m curious: what’s your favorite tortilla chip? Personally, I love Way Better Snacks, Siete Grain Free Chips (OMG SO GOOD YOU MUST TRY) and of course, the original Sun Chips. We’re definitely a chip family over here. Every time I go over to Tony’s parents house, they have at least 6 bags of chips at their house. Personally I don’t know if I have enough self control to have that many bags of chips in my house at one time. 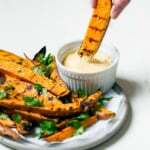 Of course, because we’re serious chip lovers over here I thought it would be fun to create an easy recipe for you. 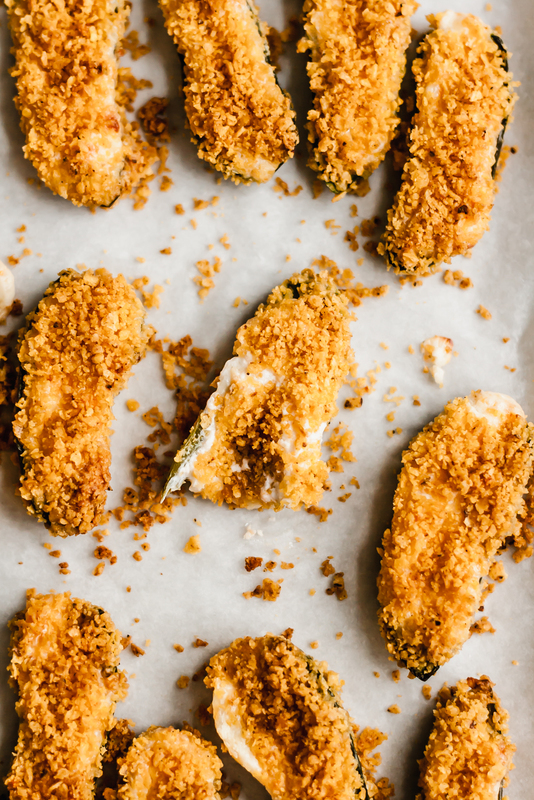 Say hello to these tortilla chip crusted baked jalapeno poppers that are way better than the fried version at Applebee’s. A delicious mouthful that you’ll want to devour ASAP after baking. As you probably already know, jalapeno poppers are typically fried. While they’re a tempting appetizer at a restaurant, they also leave you feeling overly full. So then I thought, why not bake them? You’ll know the exact ingredients that are being used and they’re just as delicious (if not more). There’s not artificial about them. 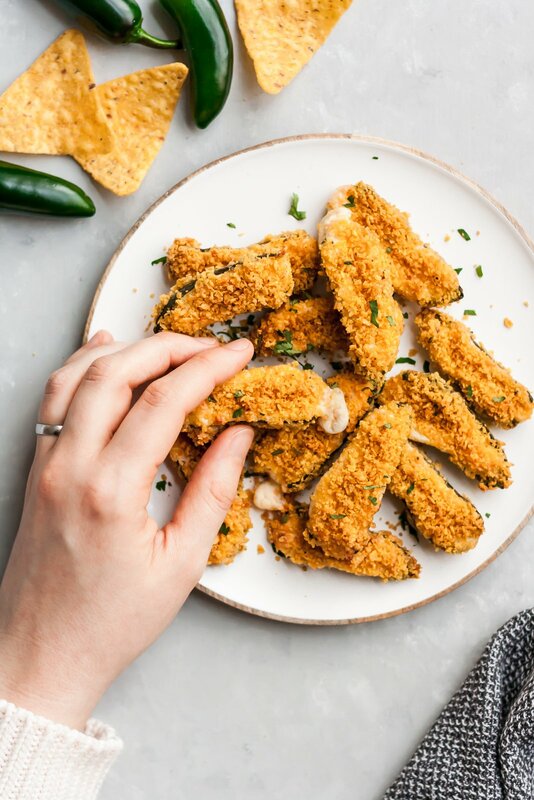 These baked poppers made the ultimate party appetizer or snack and just so happen to be a breeze to make: All you have to do is fill each jalapeno half with a lightened up cream cheese/cheese mixture, drench in an egg coating and a crunchy tortilla chip crust. Then bake, eat and enjoy! 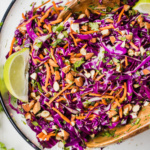 If you make this recipe, please be sure to rate the recipe and leave a comment below! It makes a difference and I love hearing from you! You can also show me your creations by tagging #ambitiouskitchen on Instagram. 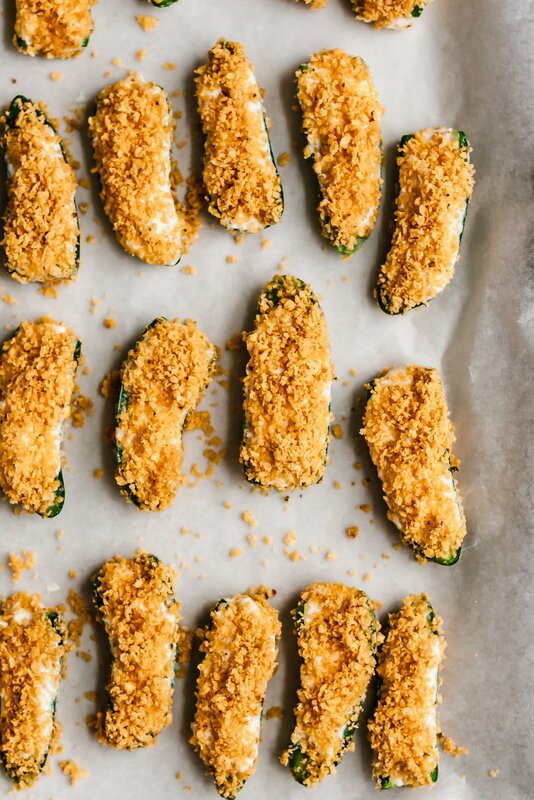 Tortilla chip crusted baked jalapeno poppers recipe that's easy, amazing and better than the fried version! 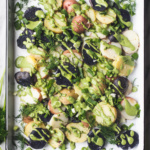 Perfect appetizer for entertaining. In a separate bowl, mix together cream cheese, shredded cheese and milk until combined. Set aside. In another separate bowl, beat together egg and egg white. Set aside. 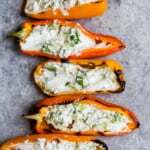 Stuff each jalapeno half with cream cheese mixture. Do not overfill. 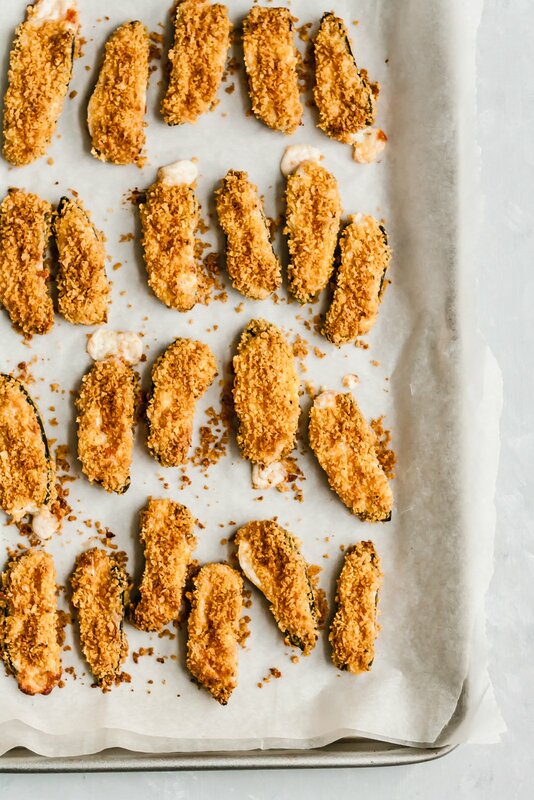 32 Responses to "Tortilla Chip-Crusted Baked Jalapeño Poppers"
YESSS. That look amazing! 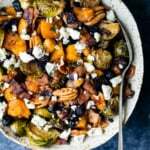 Love that this version is lightened up – if it means I can eat more of these delicious things, I’m down! Holy heck these are dreamy! SAY WHAT?! 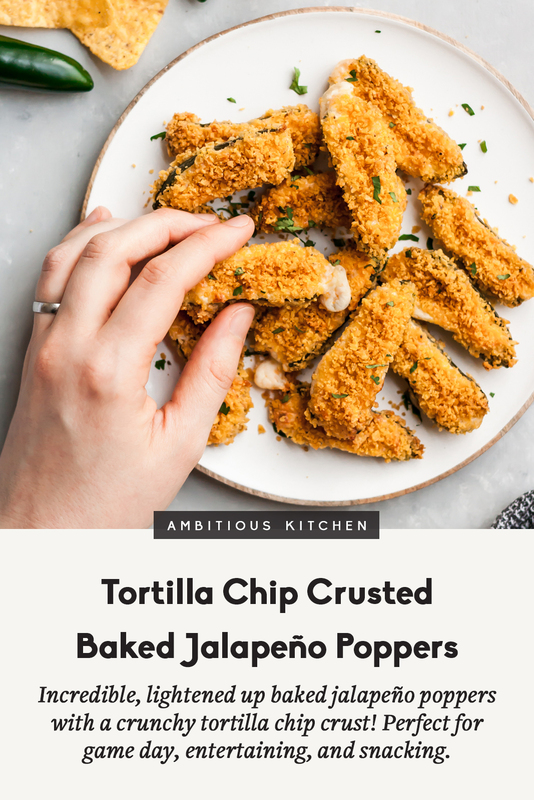 I am obsessed with jalapeno poppers and tortilla chips…so together? These are incr-EDIBLE! Pinned! Awesome photos – these look delicious. Thanks for sharing your recipe =) I’m definitely trying this one out. I just made poppers last week but never would have though of using tortilla chips. This is brilliant Monique! Love the crunch of the tortilla chips in these poppers. I will definitely be keeping on an eye for these chips. I’ve been waiting for you to post these!! yes please!! Step 1: get my hands on these chips! They’re like the Ezekiel bread of snacking! <3 Step 2: make these poppers! There's nothing better than a cream cheesy popper! I haven’t seen these chips yet but I’ll definitely be buying every variety as soon as I spot them! I want to make these poppers NOW. These look positively delicious. I’m totally crushing on them and wish I had a dozen in front of me right now. I’m trying to remember if I’ve seen this brand in Canada or not. I need to try these chips as soon as possible. Hi Nancy! I’m glad you found Ambitious Kitchen 🙂 Love that turmeric latte. I’m very familiar with Crohn’s, but can tell you that I have tons of nourishing recipes here for any diets. I would maybe suggest searching in the categories or by certain ingredients that you like to cook with. Hope you find some new ones you love! Oh my gosh! These sound perfect! These look so delicious and crunchy! I love that you used chips as the breadcrumbs!